MoonTide Fractal set. If properly scaled, like today, you can see the crossing, or "bifurcation points"
be over-emphasized. The dynamic trading range only gives so much on the average. 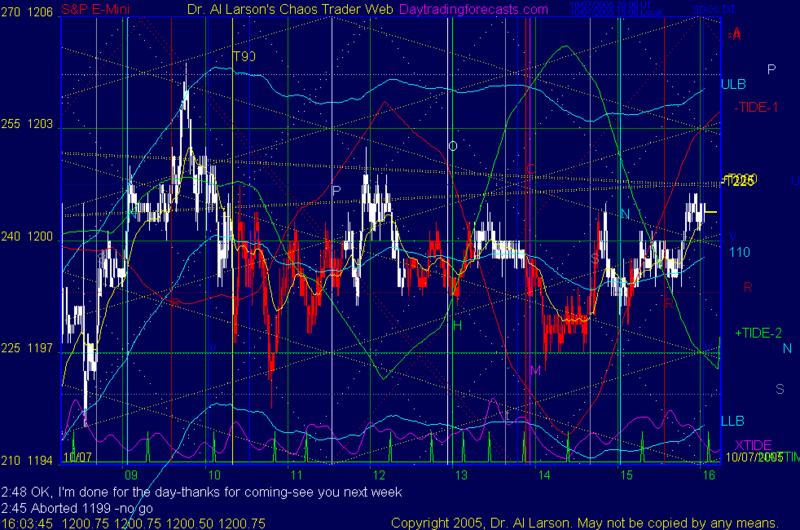 10:23 nice vertical streak down the yellow T+90 timeline - the Moon is very hot near solar eclipses. 10/7/2005 8:05:05 AM Mountain mjs:: Poor Monkey Trader has so manny bananas he can't climb a tree or get out of his trading chair. But his monkey finger can still hit the computer keys and trade. 10/7/2005 6:56:21 AM Mountain mjs:: CIOC Fight Song: Go Red Go Green Turn on the Tides Go! Go! Go!